Claire's garage sales spill out onto the sidewalks several times a year. Garage sales are symbiotic. They facilitate the disposal of the seller's accumulated junk while allowing buyers to walk away with cheap finds. When the sun goes down the garage door usually follows, and anything remaining at the end of the day is kicked to the curb or boxed up until the junk pile swells again. But at one house in North Oakland, the garage doors never go down and the pile of stuff never really disappears. Except on weekends, when the seller joins the ranks of prowling shoppers, her garage is open for business nearly every weekday. It has been for almost twenty years. In fact, Vickie aims to cultivate her clutter, not eradicate it. Like a fridge on Super Bowl Sunday, her headquarters is continually replenished with stuff: random antiques and vintage knick knacks salvaged from estate sales, donated by friends, and culled from her own collection. "If it's good and usable and cute, I'll stick it in my garage," said Vickie, who agreed to discuss her not-quite-legal sales if just identified by her first name. Vickie's fondness for garage sales is owed in part to a friend who owns an antique store. Starting in the 1980s, the two garage salers spent weekend mornings scouting out sales. They also scored things from the city's curbside pickup program, which, until a few years ago, designated scheduled junk pickups within whole neighborhoods — a scavenger's heaven. Ongoing sales like Vickie's tend to be rare. So when one persists for weeks or years, its longevity can be a point of contention in the neighborhood surrounding it. Retail sales aren't permitted in highly residential zones because they attract unwanted traffic, said John Stewart, the principal inspection supervisor for the city's building services department. "Oakland doesn't have any hard, fast rules about garage sale-ing, but we look at it in terms of 'If it walks like a duck and quacks like a duck, it's a duck,'" Stewart said. "If you're up and running five and six days a week, that is not a garage sale — that is commercial retailing." But because the City of Oakland can't afford round-the-clock inspectors, most enforcement is done on a complaint-driven basis, explained Barbara Killey, an administrative hearing officer in the city manager's office. "If nobody complains, then the city probably doesn't ever know about it," Killey said. Vickie does her best to keep things that way. "A lot of people don't even know I'm out here, which is good," she said, recalling an incident ten years ago when a neighbor reported her operation to the city. At that time, she was also selling antique furniture. After a visit from zoning inspectors who told her that the crowded setup was obstructing the sidewalk and violated the city's zoning code, she scaled down to the less conspicuous confines of her garages. The city never followed up. Amelia Maffin, an East Bay native who moved nearby Vickie last August, regularly stops by the garages to buy things and converse. "I don't think she attracts many people from outside the neighborhood," Maffin said. "It's not like people know she's out there unless they're already in the neighborhood or naturally passing through." Another neighbor, Sabrina Snyder, said she has mixed feelings about the sales, although she has patronized them and wouldn't complain unless she saw it as a problem. Vickie says she isn't trying to profit from her sales. If that were the case, she might consider advertising or asking more than a dollar or two per item. "It's like playing store," she said. "Except I don't have a toy cash register. Well, I have had them, but I sold them." Sometimes she has only one or two customers a day, but she says she likes it that way. All businesses within the city — including small businesses, which may even be tax-exempt — are required to have a business tax certificate and report their annual earnings. "You're still supposed to report what you made, even if you didn't make anything," Killey said. Vickie doesn't have a license, but if she were to file for one or attempt to report her yearly earnings (however modest), it would raise a red flag that could prompt the zoning department to shut her garage doors for good. She worries about that prospect — as the sales are her foremost passion. "It's in the blood," she said. In another part of Oakland, Claire holds sales from her two garages. But unlike Vickie, she sells mostly handmade jewelry and goods that she collects on trips to Indonesia. Because her chief venues are county fairs and markets, her garage sales are generally inconsistent, sometimes occurring only once a week or month and stopping for months at a time. But throughout the summer and between Thanksgiving and New Year's, the sales occur a few times a week. Claire shares the sale space with a friend, David, whom she met in Indonesia and with whom she shares a shipping container to bring home goods. While she imports mainly clothing and jewelry, David brings back furniture and statues. His primary business is wholesale and consignment, and he sells at the garages for fun. The two decided to try out garage sale-ing one winter eleven years ago, after feeling the effects of a slow Christmas season. "We set up a few little tables, and sure enough, people were stopping and honking at each other and loving our stuff and buying it," David said. "Then it kind of turned into a little neighborhood institution." The city has never interfered with the garage sales, he added. "We have had police and firemen stop by, and they buy gifts for their wives," he said. 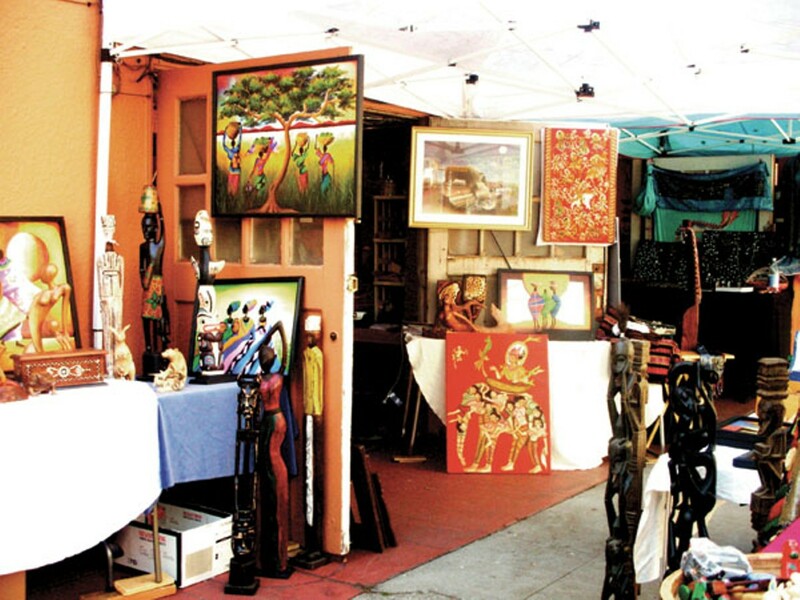 On sale days, the garage doors are pulled open, exposing colorful fabrics and shapely statues and furniture, which fan out onto the surrounding sidewalk. A large canopy shades the area, and a hand-painted sign on the corner advertises the sale. For a time, the space in front of Claire's house takes on the air of an exotic bazaar. Because the house sits on the corner of a busy street, some passing drivers, noticing the makeshift market, stop to check it out. It's not uncommon for a sale to yield a handful of browsers at a time. One longtime neighbor, who asked not to be named, said the extra traffic can be a nuisance. But he said he doesn't begrudge the sales. "If it was a huge problem, I would have complained a long time ago," he said. Claire's neighborhood is in a retail commercial zone, where retail sales can legally coexist with homes. Building services supervisor Stewart said that in such neighborhoods, homeowners can legally have retail sales within their homes, but their buildings still must meet height requirements, provide wheelchair access, and maintain an appropriate ratio of live and work space. However, Claire's house doesn't meet those requirements. "I told myself I would do what it takes to be legal," she said, explaining that she had researched the requisites for home retail sales. "So I researched it and it takes about $200,000." In other regards, Claire's sales are legitimate. Her business name is registered with the city and she pays a retail sales tax to the state board of equalization. As of March she did not have an Oakland business tax certificate, but in April she reported that she had received one in the mail. "Claire has a good gig if you ask me," said Jackie Barnes, who has lived in the neighborhood for nearly a decade. "I don't know if you have to have permits of anything like that, but she has taken a basic corner and turned it into something broader."